Very nice! I love bookmatched tops! Are you using chrome hardware? I'm actually building a P bass for a friend with a solid Black Walnut body. It's the first time I'm using Black Walnut as a solid body wood so I'm really curious on how it will sound . I may create a thread with the progress soon. That would be really nice to see! Walnut has about the same density as Maple so I guess sonically it will be pretty close too. The craziest thing to me (because I don't know how they actually do it) is the shaping of the neck by hand using tools like rasps etc. 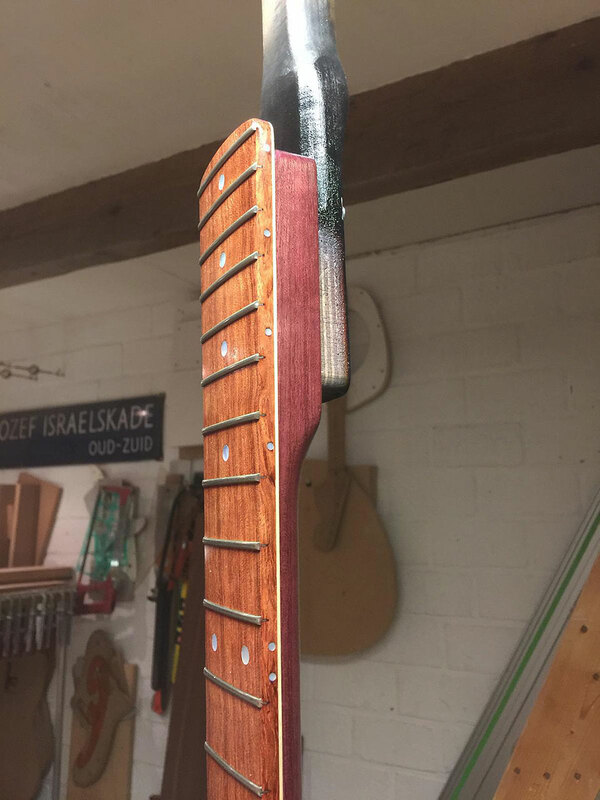 One wrong move and the neck is done. Also, how the hell do they get the neck profile correct? Mind numbing to me. 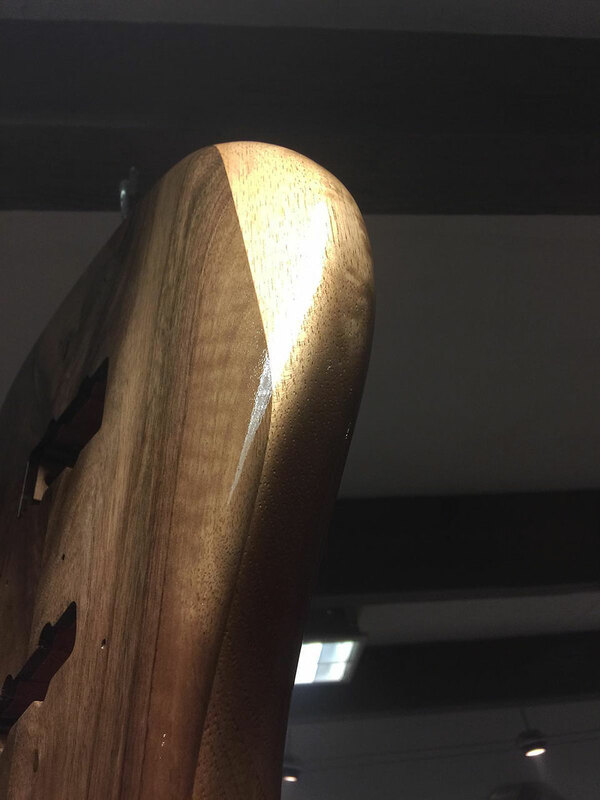 Guys and gals, do you think we could make a "Luthier's Den" section under the "Gear Talk" forum? 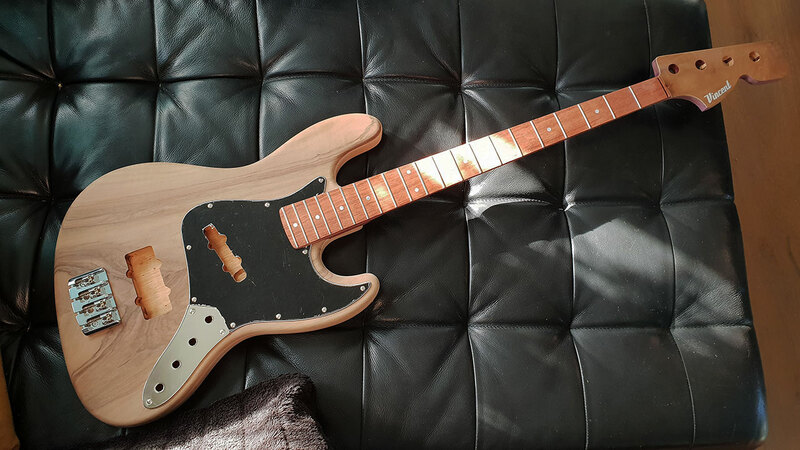 The point would be to host the content we already have about bass construction/repair, and also be a place to promote more content about certain forumers that are doing this, or the work of luthiers outside the forum. We already have a section named "Bass hardware, setup and repair". I think we could rename it to "Bass hardware and setup", keep the hardware/setup content there (since they are a bit related), then move the more construction/repair oriented stuff to the new section. @Florin? I'm not sure Yanni, threads like this one are a rarity on the forum I would think. In a few weeks, after the instrument is done this thread will fall down the path of time and be forgotten completely by most. I fully understand that. We already have forum sections that are not very crowded so to speak. I kind of think this should not be a reason not to have a section focused on such a cool subject. 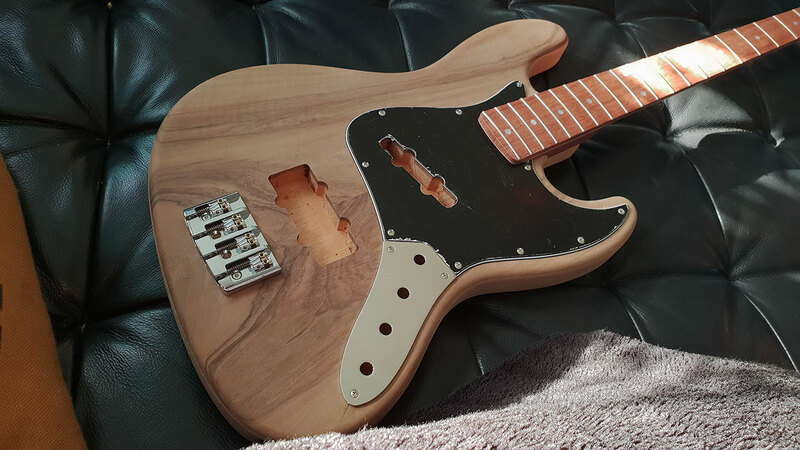 Slowly starting to look like a bass guitar. Standard control plate is on there for show. Bridge is the actual bridge. Bassist4Eris, Stainless, Hardy and 3 others like this. Vincent works fast. The curved back of the bridge was a good option aesthetically. I would have recommended a Hipshot KickAss but it is square at the back and I don't think it would look that good. Also the slanted J looks well positioned inside the pickguard. He made a lot of custom tools that help improve and speed up the process. 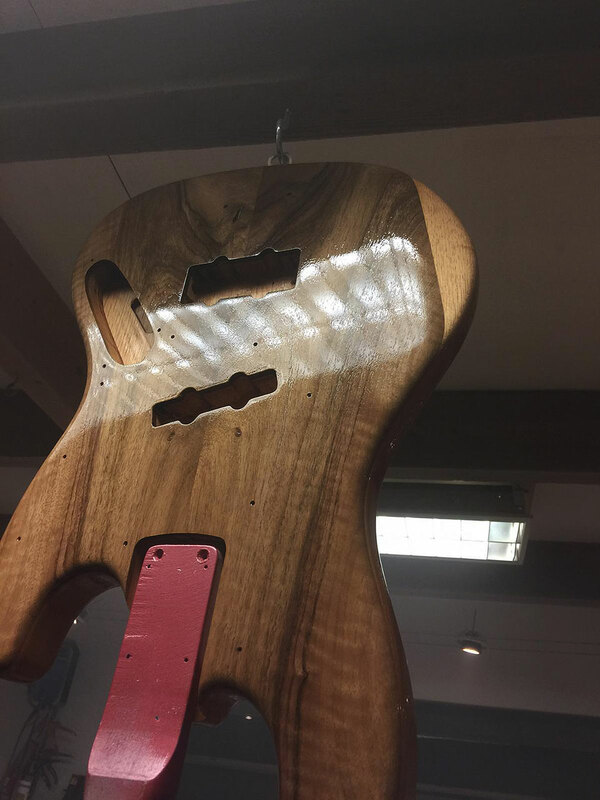 You will not see those in any pictures but be assured he is a smart luthier. Also I guess when you have a built in feel for woodworking you can get things done quicker. Besides that he's working hard and apparently loving this particular build. Once it is done of course you can expect demo samples of it. Yes, I was looking for a high mass bridge that is 3d and look good on a more classic design like the jazz. ABM seems to have been a good choice. We may have to raise the saddles 1mm extra though since it has a pretty limited range for the saddle min and max height. Positioning the neck pick up was very carefully thought out and I love the result. The pickguard even looks more balanced now then it does on a regular J. Speaking of pickup positioning: since the bass is passive and we do want low end, this is the positioning we decided on. A dolphin can get away with having everything closer to the bridge since it has an active pre. I would slant the J a little less personally, but perhaps the tonal effect is very good this way. Bassist4Eris, Toepfer, jester and 2 others like this. I are somewhat excited seeing this. A vague glimpse of a smile showing on my otherwise boring face. I think it's really cool! It could be a Section for Building/Repair/Mods, it really could be nice and I think there's enough content for that! Those of you with a keen eye may have noticed the body reveal line and slanted neck pickup are optically perpendicular. Nothing in this bass is a coincidence. J.Grim, Nieltse, DiMarco and 1 other person like this.